About a month ago I posted about blogging from your iPad and touched on 3 apps that I've been using to try to have the best experience with mobile blogging. 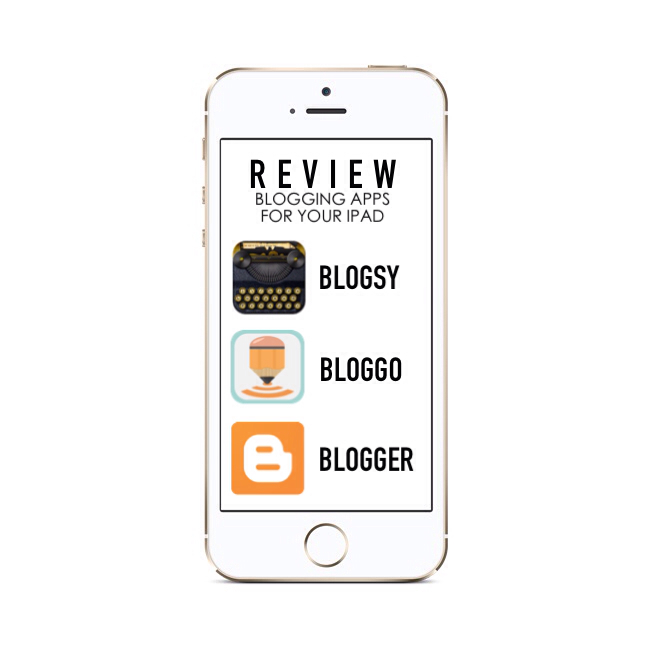 These three apps are Blogsy, BlogGo, & the Blogger app. Below I'm going to outline the pros & cons of each of these apps, how I like the, how easy they are to use & what is important to me when using these apps. This is the most comprehensive app for blogging. You have access to a lot (and I mean a lot of things) when using this app. In fact, I'm blogging from this app right now! First off this app works with a lot of platforms - since I'm only concerned with Blogger, I'm glad it works with Blogger. You can set up your accounts and from the side of the screen you are able to access a web browser, your photos, flickr, picasa, instagram, facebook, youtube, and vimeo. You can post to multiple blogs on multiple platforms and save drafts to your account - meaning the mobile app pushes the post to the web. You can save it to your account for later editing on the web or you can save a local draft to Blogsy as well. You can set the font, alignment, page breaks, bullets all with in the text editor of the app. You are also able to fully edit the html of the post. If you swipe with three fingers (or click the at the bottom right hand corner) you have full access to the html of the post. Adding links is easy with the in app browser. Something that was important to me was adding affiliate links. So far the in app browser works pretty well with my Amazon affiliate account but not so well with my ShopSense account. Pulling in images & videos is easy with access to your own camera roll, instagram, and flickr accounts. I'm not sure why you would need access to facebook - I've never needed to pull something from Facebook into my blog before! But access to photos that are in different places is super convenient. You can also adjust the size of your images by double tapping the image you've dragged in to se the size. I could keep going on because this app is so comprehensive and complex that it will probably fit a lot of the needs you have for full control of your blog posts. You can add tags, schedule posts, post between different platforms, it even saves drafts automatically for you which is really helpful- this is all the stuff I've just recently found out from this app and I know there is more to discover. Some cons about this app - not only is it the priciest on this list but sometimes it doesn't post to your blog & gives you errors. I've found that if I've left the app for a while and maybe it needs an update it can cause some weird errors that aren't in their error help log. Usually I just uninstall & reinstall the app because even after the update it sometimes causes me problems. Additionally for the Blogger platform you can not preview posts. So usually when you want to check out how a post looks on your blog from your Blogger account on your desktop/laptop you would preview it. Unfortunately that isn't an option in Blogsy. I've also got some wierdness with my photos recently but I'm attributing that to user error rather than a problem in the app. This app is $4.99 and even with the bugs sometimes I think it's one of the best out there and for five bucks I'd give it a shot! Download it here. This app was created by Dana of the Wonder Forest blog & I have to say this is a pretty interesting one. Unlike Blogsy, BlogGo is also available for your iPhone so if you think you might be using your iPhone to blog as well the $1.99 price tag makes it even more appealing. BlogGo is also a lot cuter than Blogsy and is easier to use (which is due to the fewer features). But the colors and layout of the app really appeals to the pretty lover in me! This app offers a lot of control but not as much control as Blogsy. You can post to multiple blogs you have on the same blogger account though & I would assume if you are an author of a shared blog (which I know you can do on Blogger) that would show up too under your account. The ease of adding links and photos is reminiscent of the Blogger online platform. The buttons to add links & photos are at the top of the draft post body just like in Blogger. You can add photos by either choosing the camera or by adding from your camera roll. Much like the Blogger online platform you can choose the size of your photos between small, medium, large, extra large, & original size. To center photos once they are added tap next to them and select the proper alignment. Aligning text & formatting text is easy as well because the buttons are located at the top of the draft post body as well. Some cons - BlogGo only works with the Blogger platform so you're out of luck if you don't blog through Blogger. Another thing that is inconvenient with this app is that you are unable to schedule posts. You must save the draft to publish manually later and the drafts don't save automatically. This is inconvienet as well because I zone out to something else in background and the iPad will go to sleep which wouldn't be a problem except BlogGo also bugs out when you go from the app to another app, close & reopen it, or allow your iPad to go to sleep. You also can't push the draft to your account like you can with Blogsy meaning that you can only edit your post in the BlogGo app. At $1.99 this app offers more control an can fit into your blogging routine if you plan on using your phone to blog. iPhone download here & iPad download here. The app created by Blogger has come a long way from this first post I did on the app but it still offers you little control over your blog post. The best thing about this app is that it is specifically designed for Blogger so you know it's not going to mess anything up. You can now add photos where every you'd like them to be in the post. Before, the photos only showed up only at the bottom of the post. Now, in settings, you can control the image size & set a default. For example, I like my photos to be a the X-Large setting when I add them in Blogger.....setting this as default means I'm not posting an image that doesn't match with the other images on my blog. There is the option to change the font style from regular to bold & italic so if you're creating a separate section in a post there is the option to define that section with your font style. You can also take photos through the app in case you're blogging as something is happening (??) which may be nice if you're blogging then want to capture how cute your dog looks but that image doesn't save to your cameral roll for use later. You can easily switch to different blogs you may have on the blogger platform. You can also view your published blog from with in the app, however you can not preview it. Some cons - Blogger, obviously, only works with Blogger. I'm using Blogger as my blog platform so that's great but it's not an option for other platforms. Unlike Blogsy you can't push drafts to the web app for editing later but the web app pushes to the mobile app. There is also no option for scheduling a post and you must save it to publish manually, much like BlogGo. There also is there an option to preview which BlogGo has but Blogsy does not. Unlike BlogGo, there is not comment moderation or feed option with in the app. These three apps have been fun to play with and offer various things for on the go or everyday blogging. Each offer different things - different strokes for different folks. I think all of these are great in their own ways & playing around with them may offer another tool in your blogging arsenal. What are some of your fave apps for blogging? Share them, I always need more!